Hello again! In the previous blog post I explained TDD theory in general, without close reference to Java, but in this part we start a TDD practice. Our goal is to go through all phases of TDD: from requirement analysis to refactoring of tested code. All this we will do on example with Java, JUnit and ‘fake’ requirements. As user I want to be able to create an Account. The Account should contain id, status (active / non-active), zone and balance. The balance property can not be negative. By default Account should be active, in zone #1 and with 0.00 balance. That’s how looks like an usual user story in an abstract development team. 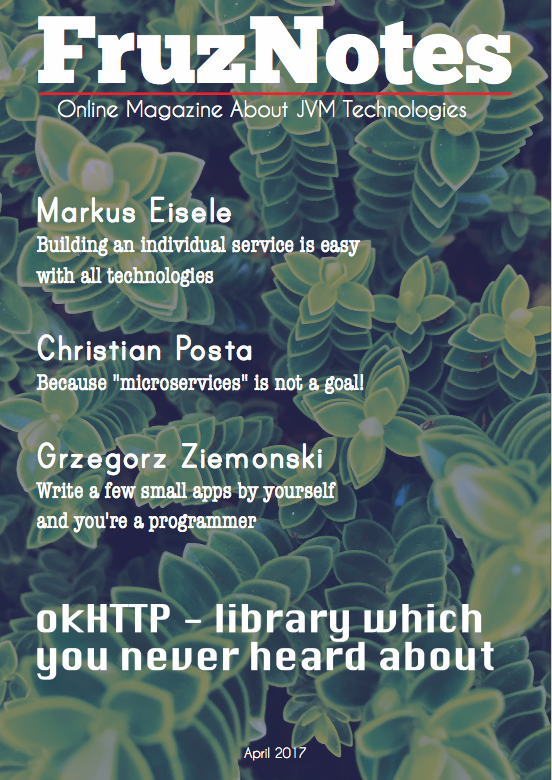 On practice the feature needs to be separated between front-end developers and back-end developers. Also we suppose that in the team already exists some code convention etc. So after the feature was assigned to me as a to backend developer, I need to clarify all questions which are not clear for me. For example what is a purpose of the zone property? Zones are used in transactions of the application. Depending on zones we charge different fees from Accounts. For now we planning just 3 zones. Ok. Now everything is clear and we can start TDD. Pay attention to Account class location and to AccountTest class. They have the same packages names, but different directories. That’s some kind of convention. When the tests are completed it’s time to see what we get in the Account class. Because within unit tests development I also created dummy declaration of required methods, constructors and properties in the Account class. As you see above, the Account class isn’t so good as it should be from the functional point of view. Constructors are useless, all properties are not initialised. But a test driven development implies such situation on the stage of unit tests creation. When we run the unit tests for the Account class we will get “red” results. 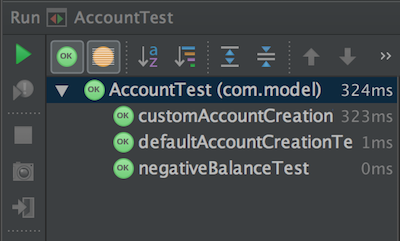 So the way to do them green is to start from the defaultAccountCreationTest(). In context of this test we have to update the Account class. Changes are pretty small but after them the unit test becomes green. You can run the updated AccountTest class. A result of the run is: one test is passed, two are failed. Then we need to repeat this operation for each of the unit tests, until all of them become “green”. Probably in more complex examples I would perform some refactoring after the tests became green. But in this simple case we do not need this. If you have any suggestions about increasing a code readability or style, feel free to leave your comment. 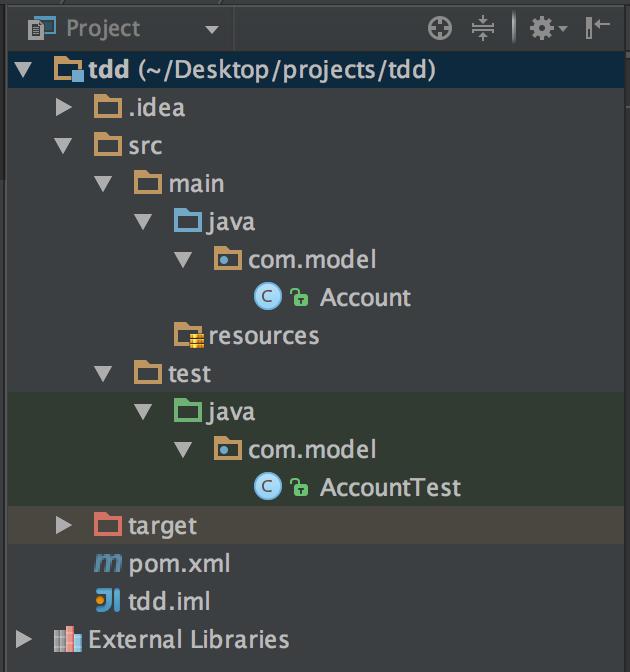 In this tutorial we examined how to develop with TDD using Java, starting from a feature analysis and finishing with “green” unit tests and refactoring. I tried to explain the TDD approach on example which isn’t too trivial but also not so complex. Any way I hope it was helpful and informative for you.